ST. PAUL, Minn. – The Mississippi River is alive again here as it flows through the Twin Cities metropolitan area. Once again, this urban river runs clear and its waters are a world-class fishery for walleye, sauger and small and largemouth bass. Its revival is mostly the result of regulations imposed under the federal Clean Water Act – enacted 40 years ago. That’s the conclusion of The State of the River Report released (Sept. 27) by the Friends of the Mississippi River and the National Park Service. As a kid growing up in St. Paul, I spent many days clambering along the banks of the mighty Mississippi – catching snakes on the bluffs and carp in the muddy water. My buddies and I imagined ourselves intrepid members of Father Jacques Marquette’s expedition, who became in 1673 the first Caucasians to lay eyes on the Mississippi. But on most hot summer days when I was young, the river smelled like the latrines at the YMCA camp I attended each year – a far cry from the river teeming with wildlife and fish that Marquette described. In a year characterized by much loose talk of job-killing regulations, the Friends of the Mississippi report reminds us that regulation works. Thanks to the Clean Water Act, St. Paul and Minneapolis have turned the river, once walled off by levees and industrial development, into a vibrant urban corridor bordered by new residential, recreational and entertainment areas. Job-killing regulations? Please. I say Happy Birthday, Clean Water Act! Sixty miles downstream of the Twin Cities, however, Lake Pepin is a different story. It’s a 21-mile natural lake formed where the Mississippi backs up behind the natural dam created by the Chippewa River’s delta, and it’s filling with mud and suffocating from algal blooms caused by too much phosphorus. 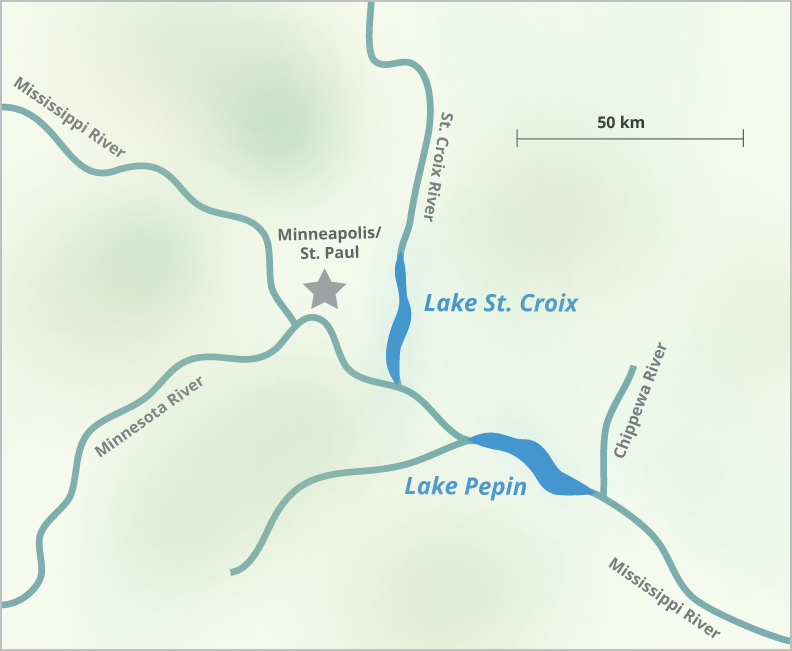 Studies by the Minnesota Pollution Control Agency and the Twin Cities Metropolitan Council have concluded that most of the mud and phosphorus deposited in Lake Pepin comes from the farm fields that border the Minnesota River, which joins the Mississippi upstream of the lake. The Minnesota River basin is intensively farmed – overall 73 percent of the land in the basin is planted with crops, and in some tributary watersheds the land is more than 90 percent cultivated. The basin’s soils are both fertile and vulnerable to erosion and polluted runoff. The basin produces an abundance of corn and soybeans, but it also bleeds soil, fertilizer and manure that all end up in Lake Pepin. Farm fields also shed lots of water that flows quickly over the tilled soil or through a vast network of underground pipes that have drained 90 percent of the original wetlands and dried out the fields to increase crop production. That rush of water collapses river banks and erodes stream channels, adding to the flow of mud and phosphorus downstream. Lake Pepin is a victim of the one fatal flaw in the otherwise effective Clean Water Act: It has limited authority to clean up pollution flowing off farm fields. The Mississippi sparkles again at the Twin Cities because the Clean Water Act forced cuts in pollution from industrial and municipal sources. But Lake Pepin is suffering because the act did little about the tons of mud and fertilizer running off farm fields. Unless Minnesota and the nation get a handle on pollution emanating from agriculture, we will never achieve the ultimate goal of the Clean Water Act – fishable and swimmable water for all Americans. Simple conservation practices strategically applied to farm fields would dramatically reduce agricultural pollution, but decades of voluntary programs have failed to get the job done. Forty years after the Clean Water Act became law, it is time to face facts. Voluntary programs must be buttressed by smart regulation that curbs the risky farming practices that do a disproportionate share of the damage – practices that, most farmers would likely agree, are bad business practice and damage agriculture’s brand.